Division of Agricultural Physics, ICAR-IARI, organized Farmer awareness Programme on “Importance of weather forecast and weather based agromet advisories” under the project entitled Gramin Krishi Mausam Sewa” at Village-Bassi, Baghpat (Uttar Pradesh) on 28th September, 2016. Around 62 farmers participated in the programme. Experts from IARI, New Delhi; Dr. B. S. Tomar, Head, Vegetable Science, Dr. Premlata Singh, Head, Division of Agricultural Extension, Dr. Ananta Vashisth, Principal Scientist and Nodal officer Gramin Krishi Mausam Sewa project, Dr. P. Sinha, Principal Scientist, Plant Pathology, Dr. R. K. Sharma, Principal Scientist Entomology, Dr. Satyapriya, Sr. Scientist, Ag. Extn., Mr. Rajendra Singh, RA, GKMS project and experts from IMD, New Delhi; Mrs Ruppa Jaggi, Mr Rambeer Singh, Mr. Pramod Kumar participated in this programme and gave their valuable suggestion to the farmers. During the interactive session, experts gave detail information regarding management based on weather conditions for increasing crop productivity. Scientist discussed farmer’s problems and advised them for use of suitable pest management practices in proper time keeping in view of weather forecast. On these occasions rain gauges were given to Mr. Sant Ram, farmer, Bassi Village. Experts also explain the benefits of weather based agroadvisory to the farmers. Field visits at different villages were conducted and feed back from the farmers were obtained. The farmers were enthusiastic in getting the agro-advisories, especially regarding the frost forewarning along with the precautions to be taken. In addition, weekly agro-advisories were disseminated to the farmers via print and electronic media. The experts committee visited different villages of NCR. Few more farmers have been added to the list of beneficiaries.Kisan Goshthi and farmer's field visits were organized in Rajpura Village, Sonipat(Haryana) on 21nd September 2013, KVK Shikohapur & Ghamroch Village, NCR Delhi on 20nd December 2012 and Nizampur Village, NCR Delhi on 26th December 2012. Kisan Goshthi and farmer’s field visits were organized in Sudana village, Hapur (IARI adopted village) on 28th December, 2012, Nizampur village, NCR Delhi on 29th December, 2012 and Kumbhavas village, Gurngaon (KVK Shikohapur adopted village) on 17th January, 2013 and got feedback. Farmers participated in the discussion and expressed their satisfaction in respect of agro-advisory bulletins communicated through IARI unit. Scientists gave detail information regarding management based on weather, soil and, water for increasing crop productivity. Experts gave advices to farmers for use of optimum irrigation water in different seasons based on weather conditions. Scientist discussed farmer’s problems, informed them about insects / diseases of different crops and advised them for use of suitable pest management practices in proper time. Experts gave advices for protected cultivation and seed quality. Experts also explain the benefits of weather based agroadvisory to the farmers. The experts visited the farmers’ fields and advised them for minimum use of insecticide, pesticide and advocated the use of polyhouse for raising healthy nursery. More emphasis was given on use of FYM, green manures and, crop rotation. They emphasized the need of weather based crop management to increase crop yield. Farmers learned web available forecast for the next five days and ways to protect crop during adverse weather. These goshthis were useful for both farmers as well as scientists. Kisan Goshthi was organized by a team of scientists from Integrated Agromet Agroadvisory Services, Division of Agricultural Physics, Indian Agricultural Research Institute, New Delhi on 17th December, 2011 at Palla, Alipur block, NCR Delhi. Scientists gave detail information regarding management based on weather, soil and, water for increasing crop productivity. Scientists gave information on weather based management for increasing crop productivity. Scientist discussed farmers’ problems and advised them for constant monitoring of aphid in present weather condition in all crops. Keeping in view of fall in temperature, light irrigation at evening time was advised, to protect the crops from possible frost injury. Based on weather conditions, suitable variety should be sown at suitable time for good productivity. The benefit due to weather awareness and crop management done at right time against adverse weather was also discussed in the goshthi. Experts also explain the benefits of weather based agroadvisory to the farmers. This goshthi was useful for both farmers as well as scientists. One day Farmers Awareness Programme was held on 18th October, 2014 in the Shikohpur Village, District Baghapat, NCR, Delhi. Sixty four farmers from surrounding villages were participated in the programme (List of the Farmers attached). Topics covered were importance of weather forecast in crop management during adverse weather conditions. Eight experts from different division of IARI and IMD, New Delhi delivered the lecture and interaction with farmers were done after each topic (Copy of the programme attached). Feedbacks from farmers were also taken. Scientists gave detail information regarding management based on weather, soil and, water for increasing crop productivity. Experts gave advices to farmers for use of optimum irrigation water in different seasons based on weather conditions and weather forecast. 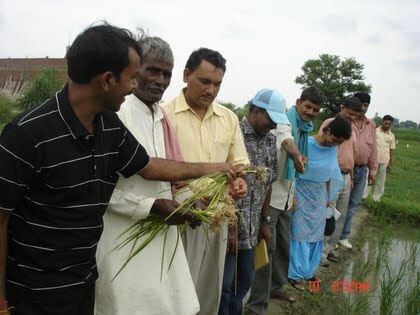 Experts visited the farmer’s fields. Scientist discussed farmer’s problems, informed them about importance of weather forecast in occurrence and spread of insects / diseases in crop and advised them for use of suitable pest management practices in proper time. The benefit due to weather awareness and crop management done against adverse weather at right time was also discussed in the Goshthi. Experts also explain the benefits of weather based agroadvisory to the farmers. Based on weather conditions, suitable variety should be sown at suitable time for good germination and high productivity. Uses of suitable resources and management practices in agriculture at right time by taking advantage of weather forecast conditions for benefit of farmers for getting more income were main emphasis of this programme. The contact numbers of the farmers were collected for sending the SMS regarding weather forecast and weather based agromet advisory. This awareness programme was useful for both scientist as well as farmers.